Our wise ancestors chose to give up their hunter-gatherer lifestyles and create permanent settlements where they could raise livestock and grow crops. That was the origin of the first agricultural societies, which appeared around 12,000 years ago in the neolithic age. The Farm is one of the very first buildings players build in Rise of Kingdoms. It is one of the four main resource buildings in the game beside Quarry (for Stone), Lumber Mill (for Wood) and Goldmine (for Gold). The building Farm produces Food overtime. You need to tap on the Farm to collect Food. 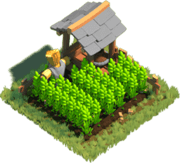 By upgrading the Farm, you increase its Food Production Speed, Max Food Capacity and the overall Power. Players can get the lots of rewards by upgrading the Farm.